Barely 48 hours after launching an ambush that killed three passengers on Tuesday, gunmen suspected to be sea pirates on Thursday hijacked a passenger boat along Nembe-Brass waterways. Militants had on August 28 ambushed a military houseboat and killed a soldier and civilian crew. 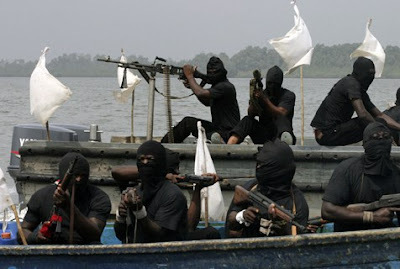 Again, last Friday, the bandits attacked an oil services vessel killing three security men on board. It was gathered in the latest onslaught by the elusive pirates, that they trailed the boat after it had dropped off its occupants in Brass from Nembe before hijacking the boat. Community sources who witnessed the incident said the suspected pirates armed with sophisticated weapons shot sporadically into the air before seizing the boat. The driver of the boat and his crewmen were later allowed to disembark at the creeks while the bandits moved on. The Chairman of the Bayelsa state Chapter of the Maritime Workers Union of Nigeria Lloyd Sese who confirmed the incident said that pirates’ activities on the waterways had made life unbearable. A youth leader from area, Robert Desmond, condemned the incessant sea pirate attacks on the waterways. He tasked security personnel to be on the alert particularly the Brass-Nembe people who are in dire need of marine security. He called on law enforcement agents to apprehend the pirates, destroy every network and arsenal they may have in their possession, in order to bring respite to the Nembe-Brass people. Asinim Butswat, a deputy superintendent of police, and spokesman of Bayelsa Police Command, who confirmed the incident said that the command has intensified efforts to check criminality and restore security in the area.